What Are Zero Turn Lawn Mowers? A zero turn lawn mower is a type of riding mower that can turn three hundred sixty degrees with virtually no turning radius due to its drive wheel design, turning the back end of the machine quicker than the front, which eliminates the rate of turn, giving you a thorough and precise cut without having to mow the same section of your lawn more than once. These types of mowers tend to be higher end models, which are more expensive, but they can be well worth the price. The design of these mowers gives you, the driver, complete control over the mower, making trimming a non issue. You can get around tight corners and the edges of your house and garden without trampling your plants. The controls on these machines are usually two levers that are situated in your lap. If you push both levels forward, you go forward. Oppositely, if you pull them back you go backwards, always in a straight line. If you pull the left lever, you turn left, and pulling the right one by itself turns the mower right, making a perfect ninety degree angle. Some of the top manufacturers of these types of mowers are Grasshopper, Dixie Chopper, Hustler, and Scag. The price ranges on these models are from one thousand to sixteen hundred dollars, well worth the high price tag for the performance and efficiency you get with these beautiful mowers. Professional landscapers use these to get around tight corners and sculpt beautiful criss cross patterns on baseball diamonds and golf courses. Whether you’re a landscaping professional or a homeowner, you will want to look into buying one of these powerful performance mowers. There are many special financing options available today from most manufacturers, so visit the manufacturer’s web site to get the best deal. Sears generally has some of these mowers on hand, and they are good at giving sales, discounts, and warranties with the purchase of a new mower. The engines on these machines are state of the art and easy to clean, require minimum periodic maintenance, and get good fuel mileage. There are different pricing options available for different budgets, so don’t let tight finances stop you from making the investment in a good, solid piece of lawn care equipment to keep your lawn looking nice all season long. More sleek and modern in their design than their large, wide turning counterparts, zero turn lawn mowers are for those who require an exact cut. The back yards of the rich and famous are cut with riding mowers such as these because they have multiple gardens and immovable objects such as statues, fountains, sculpted bushes, and other decorations that would be damaged or have their look tarnished by an uneven or too close cut. These are just some of the reasons to make the investment in a zero turn radius riding lawn mower. Dixie Chopper makes high speed zero turn mowers for professional landscaping crews with a large clientele and a large area to cover. One of their newest models can cover 4.8 acres of grass per hour, a huge advancement over the little guy. Even if you do not own a landscaping business but own your own home, a Dixie Chopper can be had for as little as four thousand dollars. These babies will more than cut your mowing time in half. If you are someone who does not care for outdoor chores, you will be able to get those tedious tasks over within as little as half an hour with one of these. These are the “luxury vehicles” of the riding mower industry. They have a very attractive design and are built to last. They really do pay for themselves over the years, with the included manufacturer’s warranties guaranteeing against defects in craftsmanship and workmanship. One of these will make you look forward to the next time you have to mow your grass…they’re that cool. You can get financing on one of these with little or no interest for the first six months, and the minimum payment on average can be as low as one hundred forty nine dollars a month, less than most car payments. Talk to your local Sears or Dixie Chopper dealer, and they will be happy to work out a financing arrangement that fits within your budget. There are a lot of reasons to buy a zero turn lawn mower, but the number one reason should be your complete satisfaction, and taking pride in your lawn. You want your lawn to grow at its best and stay looking its best all season long, and the best way to achieve this is to make the investment in a quality mower. How many companies provide lifetime warranties like Dixie Chopper? There is nary a better deal out there. 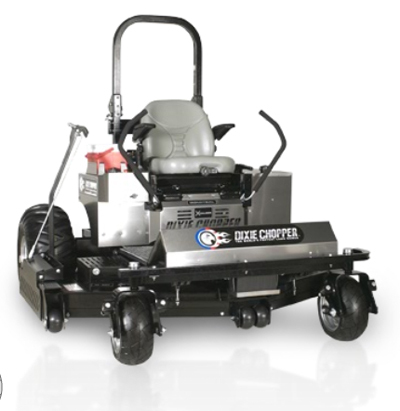 For the best quality mower you can get anywhere, consider purchasing a zero turn lawn mower. You’ll be amazed at how easy it is to maneuver around on your lawn, and how quickly the chore of mowing your lawn will get done. With the ability to get around the edges of things, weeds will not be near as big a problem as they used to be, cutting down on the cost of weed killer and pesticide spray. You will see the difference that having a zero turn lawn mower can make on your property. The front yard will look great, as will the back and side yards. Protect the value of your property by maintaining the upkeep on your lawn and home. For more questions, talk to an associate at Sears or any other fine store that sells zero turn riding mowers. Your kids will want to mow the lawn now that they’ve seen how much fun it can be. Please send prices for the zero turn mowers, as well as attachments such as baggers etc . Are there any attachments for the zero turn mowers that will allow for mowing around and under Pine Trees? if starting out I don’t see the point in spending thousands of dollars for a zero turn mower. ive seen models for as little as 2200.00 brand new that would get the job done. if buying used you never know what you’re going to get. most likely used is an acronym for junk.